Over the weekend, someone picked up on a Facebook status update by James Walker, landlord of a pub in the Cotswolds. The comments went viral, as cyclists on Twitter were none too happy about his claim that he would hit a bike whilst doing 60 mph. As Mr Walker had emails, tweets and opprobrium piled on him, he apologised. 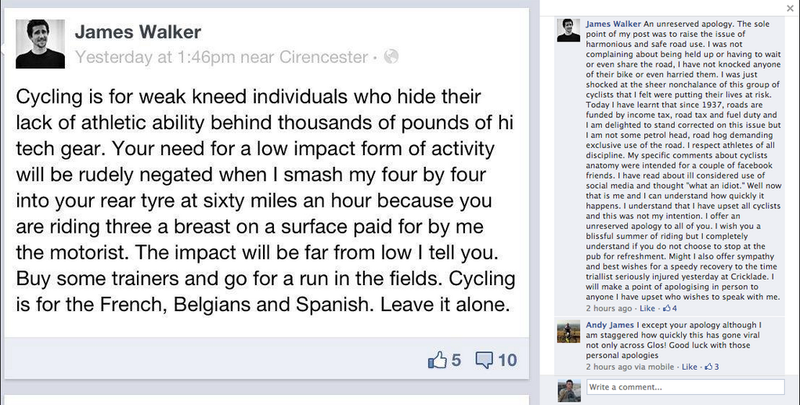 However, his comments show the kind of abuse casually thrown at cyclists, so I felt the need to reply. I realise that by now you have apologised for your remarks. I realise that they’ve ‘gone viral’ and that you’ve had a hard lesson to learn. I know that many, many people have emailed and tweeted you. Nonetheless, I will have my say because it seems to me that the lesson you most need to learn is that cyclists are people with a voice. We will talk back and speak up. You may have felt that you could threaten us with impunity but you need to realise, fully, that this is not the case. I find your jealousy quite striking. You have a need to belittle cyclists physically as ‘weak kneed’ and hiding behind hi-tech gear. Oh Mr Walker, do you not see the irony of then threatening to smash them with a 4×4? What is that, if it’s not ‘thousands of pounds of hi tech gear’? How much athletic ability does it take to operate a car, Mr Walker? How much do you reveal your need to feel powerful, your need to override your impotence by overriding their bicycles. There you are sitting behind the wheel of your car, and there are those cyclists, out there, in front, and what can you do other than sit there and fume and fantasise that you are fast and powerful when the sad reality is that you are nothing without your car, and you know that. And to add to your violent threats we have a nice little line in racism. Good old Brits, they don’t cycle. No, that’s for those pesky Latin types. Oh but Mr Walker, you went viral on the wrong day to make that jibe, very much the wrong day Mr Walker. Your little diatribe about weak kneed cyclists hit the web just as Chris Froome battled with Mont Ventoux. Do you know about Ventoux, Mr Walker? It’s a mountain, nicknamed the Giant or sometimes Beast of Provence. It has a Storm Pass though I prefer the French “col de tempêtes”. Near the summit of Ventoux is a shrine to a cyclist. Not some weak-kneed individual mown down by an idiot in a 4×4, but a shrine to Tom Simpson who, when climbing the Ventoux in the 1967 Tour, rode beyond the point of exhaustion. Such is the toughness of the Tour de France, Mr Walker (do you live up to your name, I wonder, do you walk anywhere?) such is its toughness that even fit young men such as Simpson felt the need for a cocktail of brandy and amphetamines that in the heat killed him. Thus just as your mocking, jibing jealousy went viral, Chris Froome, a gallant Brit, showed the Spanish and the French and the Belgians how you tackle a mountain such as Ventoux. The cyclists now are clean, after what happened to Simpson that kind of drugs use was banned. But Froome needed oxygen once he’d finished. Do you know what it’s like to put that much effort into anything, Mr Walker? Well do you? Do you have any idea, a single inkling, a tiny soupcon, a smidgeon of a suspicion about what it feels like to push past a pain barrier and to keep battling, fighting on and up to reach the top? I suspect, Mr Walker, that your pace is more sedentary, that your knowledge of physical effort is a little limited. And so, well, you know now, don’t you Mr Walker. You’ve been told about car tax. You’ve been told about who pays for the roads. You know that 80% of cyclists also drive. You know that cyclists like pubs and that they are less likely to drink in yours these days (personally, if I owned a pub near North Cerney right now, I’d be offering every cyclist a discounted lunch and a free soft drink, and greeting them with a big sign telling them they can watch the TdF and stuff themselves silly, because cyclists, as you would know if you were any kind of businessman, are basically just big wallets on wheels). And so you apologised. You say it is unreserved and then go onto explain yourself. You wanted to raise the issue of harmonious road use, when you threatened to plough into vulnerable road users at 60mph (9/10 people hit by a car at 40mph will die. What do you think happens when you’re going 50% faster, Mr Walker?) And you were concerned about safety, whilst you threatened people. Threatening someone whilst purporting to be worried about them is the preserve of the worst kind of manipulative bully, Mr Walker. You felt this group were putting themselves at risk. At risk of what? An act of deliberate, unprovoked violence? Your apology shows your true colours. One group of cyclists did something you felt was unsafe, or was it really their nonchalance that annoyed you? That seems to bother you, fit young men, able to take risks, is that what really bugged you? Either way, you saw a few cyclists and you then denigrated all of them. You saw fit to lump together millions of individuals as if they were just one, giant irritant that you could knock aside. And you say you respect athletes. How about you just respect human beings? Those soft, squidgy, easily killed human beings you have suddenly found some regard for, now you know they will answer back. Because today in London, another cyclist was killed. Another person trying to get from A to B died when a lorry was driven into them. Our roads should be safe and if you really want to debate harmonious road use and you really want to make them safe, start by checking your own attitude, Mr Walker.